We Suzuka Motorsports Supporters Association (NPO), is holding an event called “Victory Prayer with Original Ema” (EMA is a picture of ‘Votive horse painted on wooden tablet’) to commemorate Suzuka city’s hosting of this year’s F1 Japanese Grand Prix from October 5 – 7. Thanks to the Katsuhayahi Shrine and all stakeholders for this collaboration with us to allow this very special event be held throughout the coming F1 weekend. 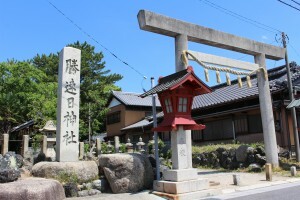 The aim is to benefit from the fortunes this Shrine and its good-luck name could bring on, while also making sure that supporters get to know better about other interesting attractions of Suzuka, also to enhance and promote better prosperity around Shiroko Station area and its community. As this time marks the 7th time for this event to be held, two (2) designs of EMA were prepared by us Suzuka Motorsports Supporters Association. All the race fans who are interested can visit “Katsuhayahi” Shrine, and write your messages on the EMA plate wishing for victory of your favorite drivers/teams, or just simply choose to take them home as memorabilia. These EMAs can be purchased at “The Suzuka F1 Japan Grand Prix Regional Revitalization Council” booth at Suzuka Circuit onsite, or at “Suzuka-shi Tourist Association” office found inside Kintetsu Shiroko Station, West Exit area. As availability of EMA tablets will be limited, they can be Sold Out quickly. Two (2) designs of Original Ema (with grace from the Shrine already) are available, priced at 500 yen each. 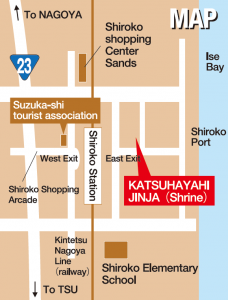 / This Shrine is a 2-minute walk away from Kintetsu Shiroko Station, East Entrance/Exit. 「勝＝Victory」,「速＝Speed」, and「日＝Rising Sun」, — are all good-luck words that can be associated with motor-sporting. 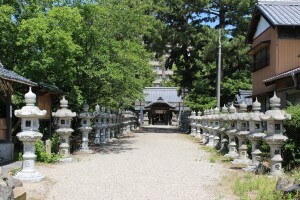 This shrine sits near Shiroko Station which is like the entryway to Suzuka. 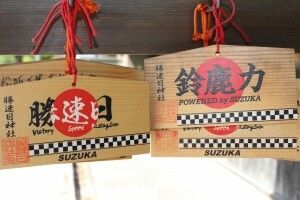 We can proudly say that there is no other Shrine more perfectly fitted to Suzuka, Japan’s greatest city of motorsports. 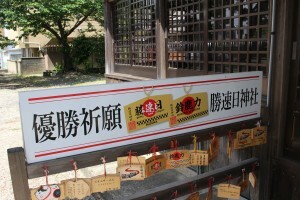 In Japan, people write down messages on “EMA” wooden tablets with personal wishes and prayers, which are then presented to the enshrined God of each shrine and temple. E of “EMA” (絵馬), in Japanese means “Picture”, MA means “Horse”. From the ancient times, horses were worshipped as sacred creatures deeply associated with God, and live horses were given as votive offerings to the deity in ceremonial festivities. Eventually such rituals transformed to drawing pictures of such votive horses onto wooden plates for this tradition to be more commonly practiced in a symbolized form. On the backside of the plate, you can write down your cheer-messages to indicate sincere support and enthusiasm for your favorite drivers and teams, then post them on designated shelves/racks provided at the Shrine or either, feel free to bring them back as souvenirs. Copyright© 鈴鹿モータースポーツ友の会 All Right Reserved.